OKLAHOMA CITY (December 13, 2017) –Why are you a schoolteacher? Why have you chosen to stay in education? What inspires you? These are some of the questions the Oklahoma State Department of Education (OSDE) poses to exceptional teachers in its #EDTalks campaign. The stories that follow are as unique as the educators who live them. The positive messaging campaign was among the recommendations from State Superintendent of Public Instruction Joy Hofmeister’s Teacher Shortage Task Force to spotlight the teaching profession and inspire others to become educators. Sherilynn Admire is a 40-year veteran of the classroom. A special education teacher at Mid-Del Public Schools, she understands the importance of knowing a child’s story. Sherilyn is one of 15 educators who has volunteered to take part in the #EDTalk campaign. The newest #EDTalk is from Christina Kirk, an eighth-grade English teacher in Oklahoma City Public Schools. Kirk chose the teaching profession after many years working as a lawyer. You can watch Kirk's #EDTalk here. The #EDTalks have a combined 100,000+ views on social media, the primary platform for sharing the segments. Educator preparation programs in the state are utilizing the videos for recruitment purposes. Stephoni Case at Southern Nazarene University, for example, shares #EDTalks with her Education Leadership students. At the University of Central Oklahoma, Bryan Duke said #EDTalk videos help showcase why professionals looking for purpose and meaning in their careers should consider teaching. “These narratives make clear the many opportunities teachers have to be communicators, problem solvers and innovators in an effort to help students — and sometimes their families —learn and live better lives,” he said. 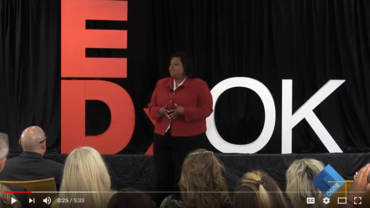 To see archived #EDTalks, click here. If you are interested in using the videos for recruitment, contact Deana Silk at deana.silk@sde.ok.gov.